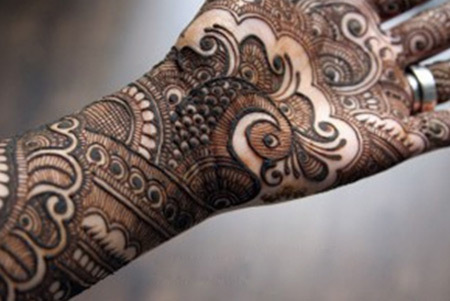 Bisha Mistry is a renowned mehndi artist, known for her intricate designs. 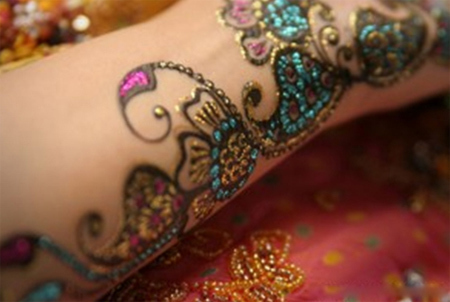 She is a qualified artist with professional experience of over five years and a dedicated zeal for mehndi. 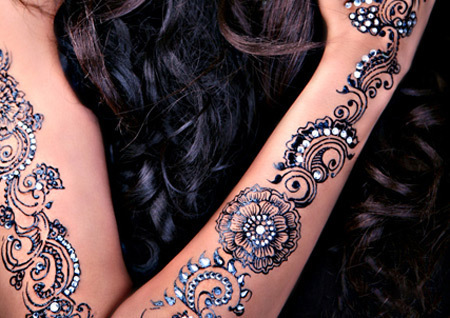 Her inspiring designs speak volumes about her talent and expertise when it comes to henna and art. Whether you are looking for contemporary, traditional designs or a completely different style, Bisha Mistry can provide you with ideas and designs to suit your occasion. This henna artist is adding an edge to her creativity by adding gemstones and jewelleries to her henna designs too. 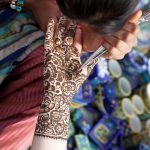 She is mostly sought after by brides, who desire exceptional mehndi designs on their hands and feet to make their important day truly memorable. Given Below Are Some Interesting Designs By This Top Mehndi Artist. 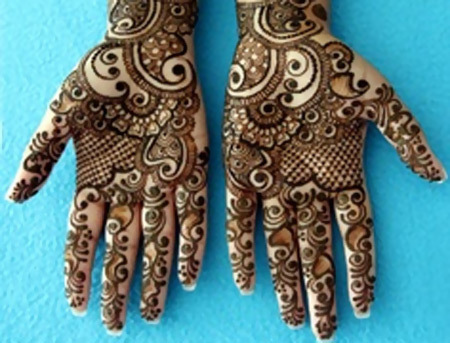 This mehndi design for the hands is ideal for to-be brides to mark their memorable day. This traditional floral design goes well with Indian outfits and can complement the overall look. The intricate design and spacing are so precise that they speak volumes about the expertise of the design artist. This design is another fine piece of art from Bisha Mistry. While closely inspecting the design, you can easily make it out to be the masterwork of a fine and qualified artist. The portrayal of the peacock in the centre of the palm is the highlight of this intriguing design. Bisha Mistry is not only appreciated for her traditional bridal designs, but has also proven her expertise in contemporary mehndi designs. 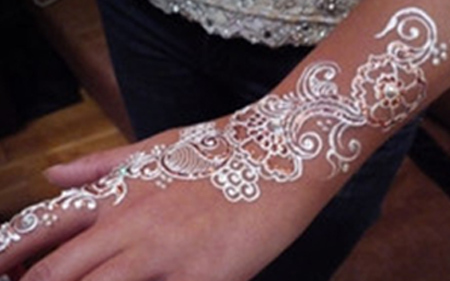 This white henna design at the back of the hand is perfect for young girls and can suit any occasion. The design also works as a great skin decoration. This is one of those “Bisha-esque”, flawless designs, transferred beautifully on the hands with superb perfection. This mehndi design by Bisha Mistry is one of the most sought-after ones that has become a craze with one and all. This lovely design is made using Ash Kumar glitter gels, mainly black, blue, pink and golden colors. Bisha Mistry is acclaimed worldwide for her customized designs. 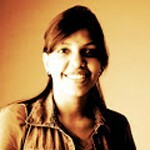 She works dedicatedly to create intricate designs to suit her client’s need. 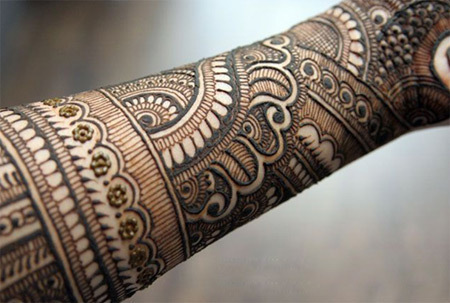 This design also finds its place in the top 10 list of this celebrated mehndi artist. Perfect for the occasion of a wedding in the family, this design is loved by one and all. 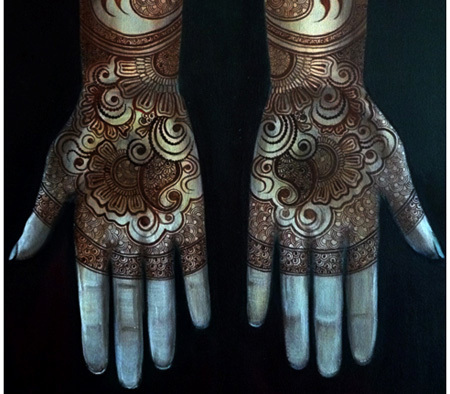 This one is a really cool mehndi by Bisha Mistry that showcases how passionate she is about her work. Starting right from the tip of the finger and extending to the upper arm, this design makes use of Swarovksi in the best possible way. Swarovksi mehndi designs are catching up as a cool trend among brides worldwide. This design is surely going to make you the centre of attraction wherever you go. This is another classic piece of work by Bisha Mistry. It is an Arabic design that beautifully showcases floral patterns. This design is becoming increasingly popular with the modern woman. The detailing used in the design is unbelievably accurate and truly worth the time taken to create it. This is one of the amazing designs from the talented mehndi artist, Bisha Mistry. The intricacies of the design make it perfect for bridal occasions and will surely mesmerize any onlooker. Bisha Mistry is one of those passionate artists who willingly create unique masterpieces of art by encompassing her client’s likes and needs. 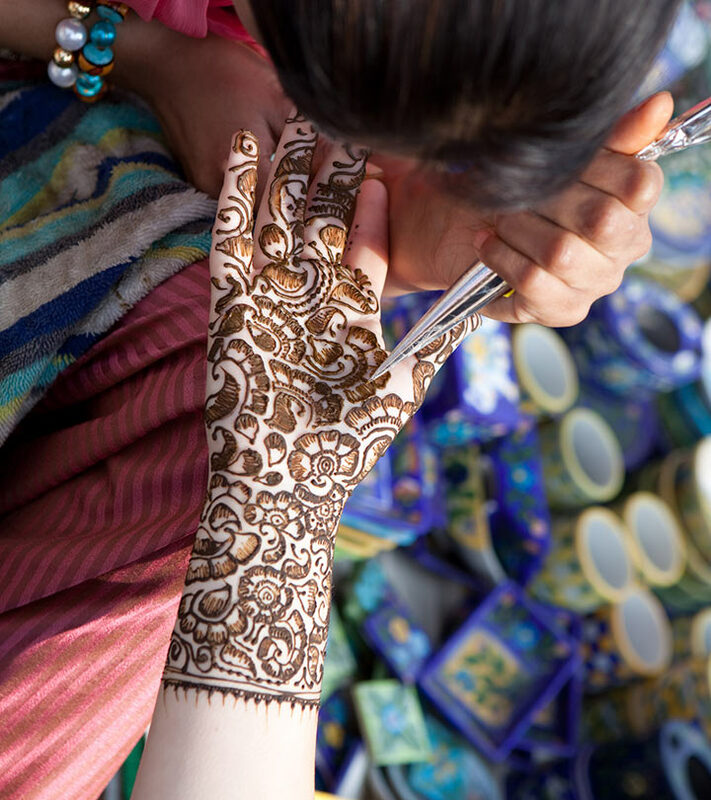 With a rapid increase in the number of mehndi design artists, choosing the right one can be really difficult. However, your search for contemporary patterns and designs with a tint of glitz, ends right here. Try any of these Bisha Mistry exquisite mehndi designs that are most suitable for the modern and young bride.